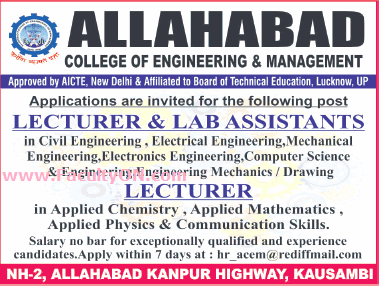 Allahabad College of Engineering & Management, Kausambi has advertised in THE TIMES OF INDIA ascent newspaper for the recruitment of Lecturers / Lab Assistants jobs vacancies. Interested and eligible job aspirants are requested to apply within 07 days from 08th August 2018. Check out further more details below. About College: ACEM was founded in 2010. Since its inception, it is associated with eminent personalities from the Engineering and Management Gurus. The affairs of the Institute are managed by a Council which, in turn, consists of Board Members. Each of these members is an achiever and a scholar. At ACEM, our main objective is to ameliorate the overall position of the students belonging to the lower and middle classes of our society, who have, so far, been bereft of their due privilege to have professional education.